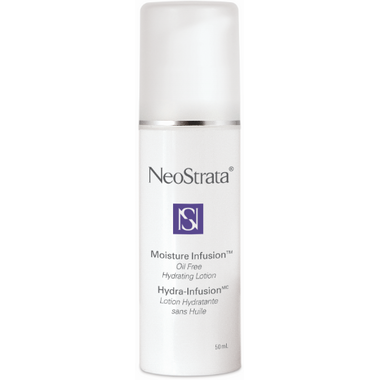 Light textured and non-comedogenic, NeoStrata Oil Free Moisture Infusion Lotion is perfectly suited for optimal hydration for combination and oily skins. Directions: Apply 1 or 2 times daily. Aquarize IS™ and AQUAPHYLINE® are two highly effective, natural moisturizers that create a unique blend for optimal and long-lasting hydration. This lotion contains 1% Aquarize IS and 2% AQUAPHYLINE. Amazonian white clay is a mineral-rich powder that absorbs excess oil without drying the skin. This is a good moisturizer for all skin types, however I wish it didn't contain dye. The gel is blue and I find this unnecessary. It's scent free though which is a bonus. Love this moisturizer - been using it for years. This is my go-to moisturizer. I love it for my combination skin. It provides just enough moisture without being too much or too little. I love that it's fragrance free & doesnt irritate my super sensitive skin. Great product. I've tried many creams that say they work for combination skin, but this is the first product that suits my skin perfectly. I usually get the oily feeling on my face after a couple of hours with past products but not with this one. I am very happy with the results. I find this moisturizer good for my oily T-zone, but I need more on the other areas of my face. I'm not sure whether I will purchase this one again. Good product. Suits my combination skin. Not oily or greasy. Excellent product. Very efficient. Light and non-oily. I've been using this product for 2 wks now and I love it. It's non-greasy and very lightweight. I haven't had a problem with the pump, but I do wish it didn't have the pump. I'm a lid person. Would I buy this product again, yes I would. The moisturizer itself is great because it's lightweight and doesn't make my skin oily. It is perfect for my combination skin. However, the dispenser it comes in is so annoying to use! Every time I use it I spend more time than I need to trying to pump the moisturizer out and it never comes out! I ended up taking the nozzle off and just banging the bottle upside down against my palm to get the moisturizer out. I would love to keep buying this product but fear that because it's so hard to extract from the bottle, I may not! This is my favorite moisturizer, it works exceptionally well. I use benzoil peroxide (please excuse my spelling!) as part of my acnce treatment and it really dries out the skin and sometimes I have to keep applying other moisturizers several times a day, not with this, I love it. Only reason I rated it a 4/5 is because sometimes when it gets soaked in the skin (or maybe it's a reaction to the other products I use) tiny little blue gelatin pieces form on the skin... You can easily wipe them from your face but you don't always notice them because you're not always looking in a mirror!